Egypt's army spokesman Mohamed Samir said Saturday that military troops in North Sinai had raided a "terrorist den" killing 12 suspected militants. The attack, which took place near the restive town of Sheikh Zweid, also saw the arrest of 11 suspected militants and another six wanted by authorities. 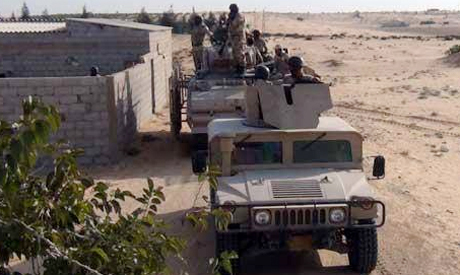 Around 36 houses and 40 huts allegedly belonging to jihadists were destroyed by the army. The army has waged an intense crackdown against militants in the peninsula in response to a spike in attacks targetting and killing hundreds of police and army troops since last year's ouster of Islamist president Mohamed Morsi. Keep them on the run in the desert.